"We are very excited to test this innovative technology in our experimental facility of Concept Grid; the system has been successfully installed and connected to the grid. Thanks to the unique EDF experimental facility of Concept Grid, we will reproduce real distribution networks and test DuraStor® in fully controllable conditions of operation and thus demonstrate the interest of this technology in the future smart grids," says Etienne Brière, Renewables and Storage Program Director at EDF's R&D. The DuraStor® by STORNETIC is designed for industrial customers with many charging and discharging cycles. Unlike other storage technologies the flywheel keeps its full capacity over the complete lifetime while combining the advantages of mechanical energy storage, such as sturdiness and endurance, with the advantages of modularity and rapid installation. The device operates purely mechanically - without the use of chemicals - and is made of materials that are fully recyclable. As an innovative short term energy storage solution it enables operators of micro grids around the globe to transform electric energy into rotation energy and store it. The Concept Grid laboratory is a unique smart grid test facility located in the South of Paris. The laboratory is dedicated to the validation of innovative solutions for the electrical system. It aims at reducing the time to market of new smart grid technologies, by helping manufacturers, start-ups and academics to understand and meet the challenges of real field environment. Concept Grid is also a key laboratory for utilities to prepare and de-risk experimentations through accelerated test campaigns that would be impossible to conduct on the field. Concept Grid is composed of 10 km of real electrical medium and low voltage networks, it has several substations and test areas, a neighbourhood of five small houses fitted with local generation, and it can also perform bespoke scenarios with power hardware in the loop simulation. Concept Grid is open to external customers and collaborations. 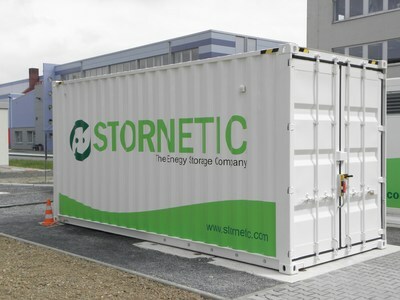 STORNETIC develops, manufactures and markets energy storage systems. The flywheel energy storage unit DuraStor® operates purely mechanically and transforms electrical energy into rotation energy and back. The system is designed for a very high number of charging cycles and retains its full capacity and power over its complete lifetime. Areas of application: Grid Services, Micro Grids and Island Grids, Hybrid-Systems (e.g. in combination with thermal power stations or batteries), breaking energy of rail vehicles, wind energy.